Here are some tips for how you can apply redstone programming in Minecraft— specifically, in Survival mode. Check out these ten ideas for using redstone that you may find particularly useful or interesting. Many farms can be self-harvesting — automated to produce items with little to no input from you. In a game where no resource is permanent, a constant source of items is one of the most permanent ways to make progress in the game. 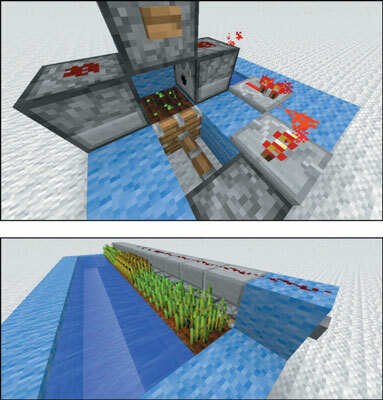 Here are two examples of automatic wheat farms using redstone circuitry. To build these farms, all you have to do is copy these designs. (You can also work them out yourself or find more designs online.) 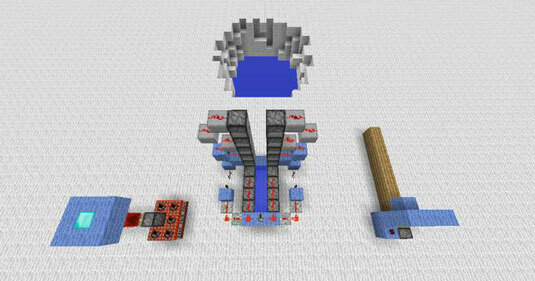 In the first design, be sure to place a redstone torch on the back of the rightmost dispenser. Also be sure to use sticky pistons in both designs. Sometimes you can use automatic functions to make your manual functions more efficient. For example, if you hook up pistons to the bookcases around your enchanting table, you can improve the table’s enchantments whenever you want, and you can remove the bookcases quickly whenever you just want to give an item a simple enchantment. If you encounter a dungeon, don’t destroy the mob spawner at its center! This spawner represents an infinite supply of monsters and, consequently, an infinite supply of items. A dungeon farm is a machine, often requiring little to no redstone circuitry, that automatically destroys these mobs and salvages their items for you. Make them fall a long distance. Place them near iron golems. Use a piston to push a block over their heads. Submerge them in water for a long time. To do this, surround the spawner with deep pits, iron golems, tanks of water, or whatever else you need. Draining a mob’s health is fairly intuitive, but if you’re having any trouble, tons of designs are available online to help you out. You can make a mob farm in another way. It’s slower, but you don’t need a dungeon for it. All you have to do is build a giant room with the proper conditions for mobs to spawn. Then you can build the farm around that room, using the same tactics as with a dungeon spawner. Build minecart tracks between your house, your mine, and wherever else you venture. You can use redstone circuitry to automatically load a minecart and change the tracks. You can even send storage minecarts along the track to transport items. Minecarts act like entities, so they can be destroyed by physical damage. 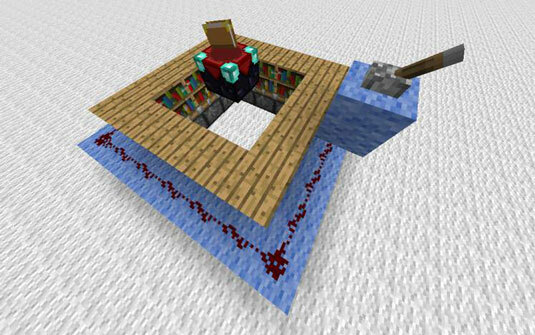 If you create a machine that destroys minecarts on arrival, and place a hopper underneath, you can reload your minecart system automatically by turning the minecart into an item and storing it beneath the tracks. Defense mechanisms are fun, advanced ways to protect yourself and your home. Raise walls around your base at night, create traps that drop the undead into deep chasms, or automatically place blocks in front of your wooden doors whenever you flip a lever. Items such as daylight detectors and pistons are useful in defending your home with style. You can also use machines to assist you in your nightly ventures. A simple pressure plate surrounded by open doors can trap any mob you lure in, and some well-placed levers can allow you to activate nearby traps if you want to capture certain mobs rather than destroy them. Though some machines make your Minecraft life easier and more automatic, others can make your home more dynamic — or at least more interesting. Cover dark areas with redstone lamps to use as mechanical lights, create walls with collapse to reveal chests and crafting stations, or make bridges that rise from pools of lava, for example. You can do a lot of interesting things with blocks that receive redstone power. Elevators can be tricky, requiring you to move the same block up and down over a large distance. Fortunately, simpler versions can move a player vertically with relative ease. One of the simplest techniques is the slime block elevator. Essentially, this device is meant to send the player from the slime blocks below to the platform above. The player can flip the lever to open the ceiling, launch herself through it with the slime blocks, and then close the ceiling again in order to land on the floor above. Sorting through chests can be a pain, so it’s often helpful to put your most commonly needed items into a dispenser or a dropper. If you stand right next to a dispenser filled with armor, it automatically equips you; similarly, you can use a dropper to hand you your battle gear. Use daylight sensors, comparators, and other observant devices to tell you exactly what’s going on — for example, what the time is or whether your steak has finished cooking. Redstone lamps and note blocks are useful in this regard. If you manage to make an enemy out of another player, some of these techniques can be useful. A trap based on a block update detector that ignites a cluster of TNT whenever someone opens the door (learn how to use TNT in Minecraft). This is nothing more than a block update detector. A modification on the classic TNT cannon, which fires waves of explosives at the target. Build your own by copying the example and filling all the dispensers with TNT, or look at some of the many designs online. A 12-block-long bridge that lets you build outward without making yourself vulnerable to enemies with ranged attacks. All you need is a piston, a means of powering it, and a bunch of blocks.